Published: Oct. 7, 2018 at 07:24 p.m.
Arizona Cardinals linebacker Josh Bynes scores a 43-yard touchdown off of a San Francisco 49ers quarterback C. J. Beathard fumble. Published: Aug. 26, 2018 at 09:00 p.m.
Arizona Cardinals cornerback Patrick Peterson refuses to be hurdled, forces fumble. 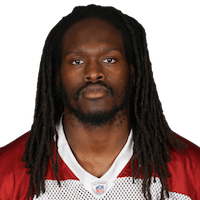 Published: Dec. 10, 2017 at 06:52 p.m.
Arizona Cardinals linebacker Josh Bynes intercepts Tennessee Titans quarterback Marcus Mariota.